Our Murder Mystery Dinner Theater is happening again on Saturday, May 11, at 6:30 pm. This is one of the most enjoyable experiences you will have, so be sure to mark it on your calendar and bring your friends for great food, fellowship, and to help solve who did the deed and why. Feeling lucky? You came to the right place – the Pocono Royale Casino, the first gambling casino in the Poconos! Owner Rick lost his first casino in a nasty divorce settlement, but he’s back in the action again with a brand new joint. Now the money’s rolling in and so are the senior citizens. So what if they gamble away their Social Security checks? It’s a free country, right? That depends on who you talk to. The Native Americans thought it was a free country before the white men came and took it all away. Now Chief Wooden Nickel and Princess Wanna Wampum are back to reclaim what’s rightfully theirs. When Lola, Rick’s gold-digging ex-wife appears, it’s obvious she has more on her mind than a family reunion. Luckily, Rick has a sharp lawyer who’s taking care of business — but whose business? And what’s with those elderly Portabella sisters? They’re supposed to be playing the slot machines, but they’re watching male strippers and sticking their noses into everyone’s business. Tonight you’ll also meet a Choc Chaser on a losing streak and Rick’s daughter, Candy, who wants to be a showgirl but has two left feet. Will the Native Americans take over the casino? Will the Choc Chaser win back his farm? Will the Portabella sisters find their missing g-string? Will Candy ever learn to dance? Will the lawyer decide how to play his cards? Will Lola and Rick get back together for richer or poorer? And will Rick ever be cured of his Bogart complex? Stick around and keep your eyes and ears open. Because at the end of the night, someone will cash in his or her chips for the last time — and it’s up to you to solve the murder! 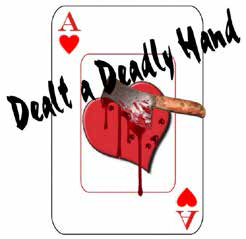 “Dealt a Deadly Hand” will be directed by Illustrious High Burns, 33°, and it all starts at 6:30 pm in the south lounge of the Cathedral. Tickets are $50 per person — Please order on Eventbrite at this link.